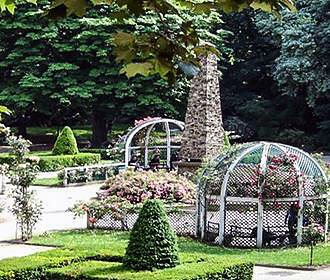 Originally a garden belonging to the Manufacture des Gobelins Tapestry Museum, it was renamed in the 1940s and has expanded over the years to provide park benches, monuments, a rose garden with gazebos, childrens playground and more for locals and tourist to enjoy. 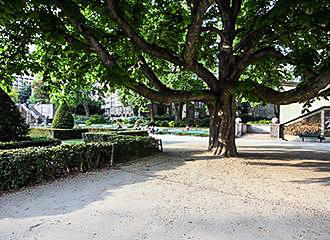 Now this square in Paris was originally a vegetable garden belonging to the Manufacture des Gobelins Tapestry factory dating from the 1600s, which is still running today providing the skills needed for restoration of furniture and other items that are held in numerous museums in Paris. However, this tapestry factory, also now has its own museum called the Manufacture des Gobelins Tapissiere Tapestry Museum, which is a fascinating place with a lot of history. But getting back to the garden itself, it was designed back in the late 1930s by the architect Jean-Charles Moreaux in a neoclassical style and is located on what is now an underground river called the La Bievre. In 1981 the Square Rene le Gall had expanded by over 5000 metres squared and along with a landscaped garden a childrens play area was also put in place along with a lawn and cedar trees being planted. But in 1993, this unusual garden in Paris was extended yet again, and even as recently as 2012 other aspects have been added including some landscaping redevelopment that symbolises the journey of the River Biavre that can no longer be seen. It was designed with four gazebos and a rose garden in a geometric pattern along with an obelisk in the middle of this area that was originally located within the centre of the square before its expansion. And this provides a small, yet classical aspect similar to a garden you would find at one of the chateaux in France, with its small bits of grass and well trimmed hedges, and of course the roserie. In additional to this, close to the obelisk, you can find a very impressive specimen of a horse chestnut tree that measures over three metres in its circumfrance, which was actually planted way back in 1893. Also the Square Rene le Gall garden has some very unusual features and different entrances, one of which is via a ramp, but close to the rose garden there is a staircase entrance, which was designed by Jean-Charles Moreaux who was inspired by a 1600s Italian painter. And the unusual design on the wall includes stones and fossils with masks that have also been made out of these materials. Now in the centre of this garden in Paris, focussed upon a central isle, the area has been divided into groves that have been planted with different species of trees including sycamore and ash, plus you can discover blue cedars around the outside edge by the railings. 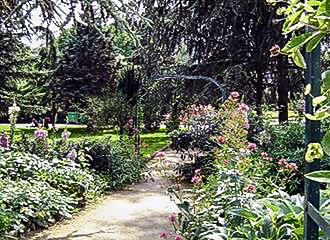 In the upper part of the Square Rene le Gall, which is still sometimes recognised as the Jardin des Gobleins, you will find many different varieties of shrubs and perennials that have been out, along with an artificial stream that follows the course of the river, which as we mentioned before, is now piped underground. 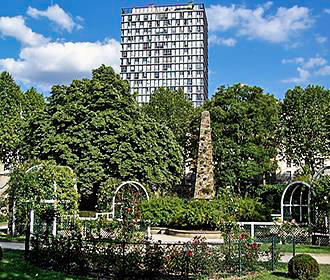 The first appearance of a childrens playground within this garden and square in Paris was in 1981, which includes swings and a sandpit, plus there are even table tennis tables. Yet even more recently when the area was redeveloped even further, a large sports ground was also added to the Square Rene le Gall, which therefore makes it a very popular destination for families. You will find the square located in the 13th Arrondissement and there are several different entrances to the Square Rene le Gall, including the original one, which meant you had to negotiate the concrete staircase. 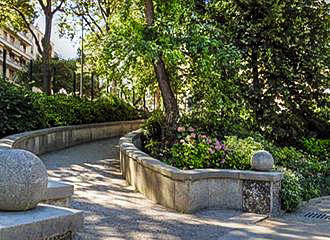 But since the redevelopment of the garden and the major improvements undertaken over the last few years, you may be pleased to know that there are ramps allowing for disabled access on the Rue des Cordelieres and the Rue Corvisart. The square and garden is normally open from around 8am through to 7pm daily, however, during the summer months it can close slightly later, and in winter it can close earlier, just like many of the gardens in Paris do. 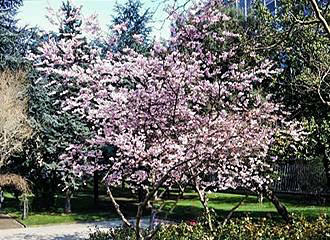 You may also be pleased to know that there are plenty of areas for relaxation including numerous park benches, along with a drinking water fountain and public toilets including a baby changing area and disabled facilities, but unfortunately some areas are still inaccessible to the disabled. And when it come to reaching the Square Rene le Gall Sqare, the nearest Metro station is the Les Gobelins stop via line 7, yet for those of you who prefer getting around the city of Paris yourself, if you are utilising the Velib self service bike hire in Paris, then there are two bike stations that are also located closed by as well.